…is a new style of independent press. Our goal is to support local, independent authors through the publishing process with affordable services such as editing, design, printing, a trade catalog, distribution, and marketing support. 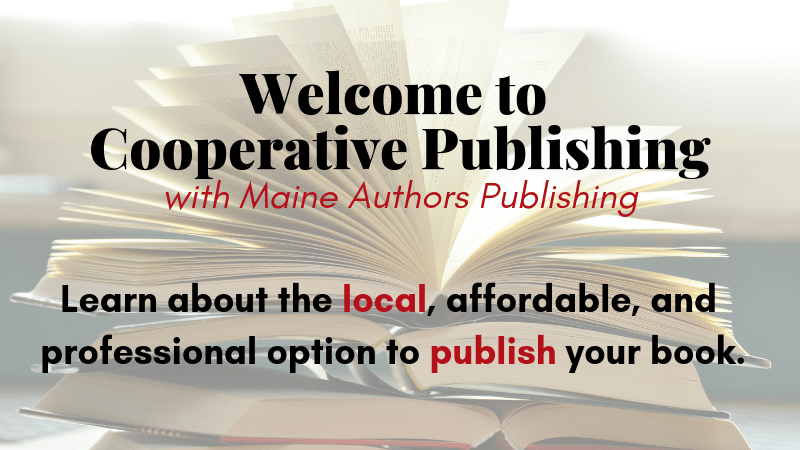 Maine Authors Publishing helps independent authors get their books published and in the hands of their readers. This is done affordably, even for first-time authors, by taking advantage of new technology that has made small print runs less expensive and by offering authors a variety of cooperative style marketing opportunities and a la carte services to fit each author’s individual needs and budget. Authors are offered inclusion in our cooperative-style color trade catalog, bookstore invoicing, fulfillment and cooperative sales. No matter what online “publishers” will promise you, we have learned that marketing books is very “hands-on” and requires hard work, author support and long term relationships with bookstores and niche markets. Attend our monthly orientation class to learn about who we are and what we can do to help you publish your book! Click here for more information or give us a call! Click here to view and download the Spring/Summer 2019 Maine Authors Publishing Catalog!